Chris and Matt have been great friends for many years with Jamie, an American who now lives and works in Denmark. Jamie and his Danish partner Morton arrived late Thursday night from Denmark. 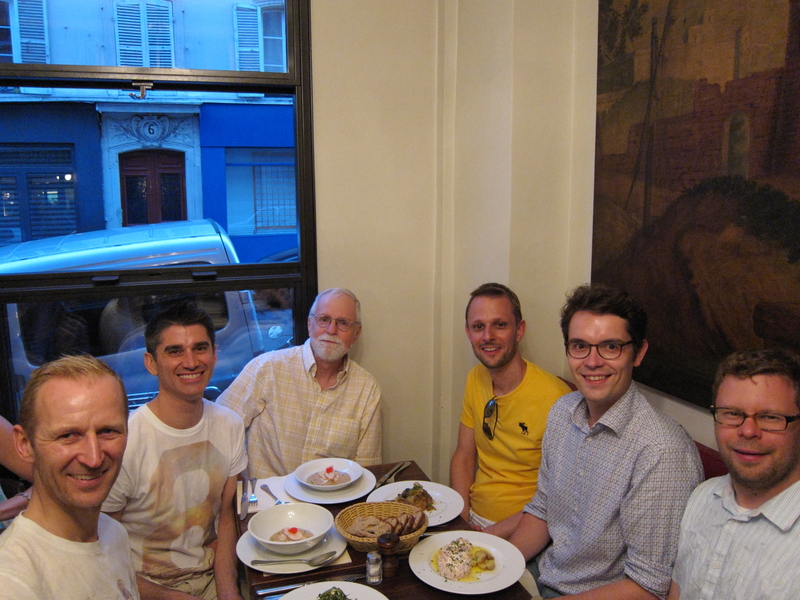 We all met up for breakfast on Friday, at a café on rue Montorgueil. 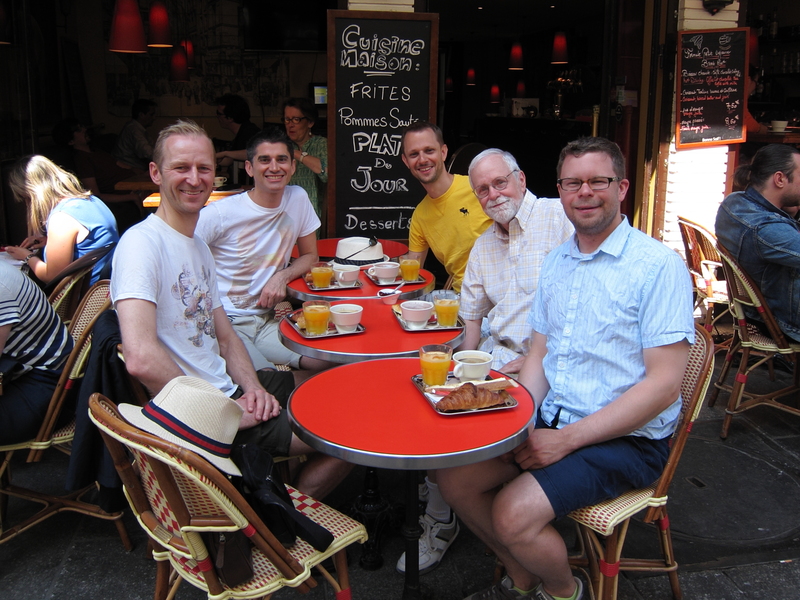 Morton, Jamie, Matt, Bob and Chris at breakfast on rue Montorgueil. 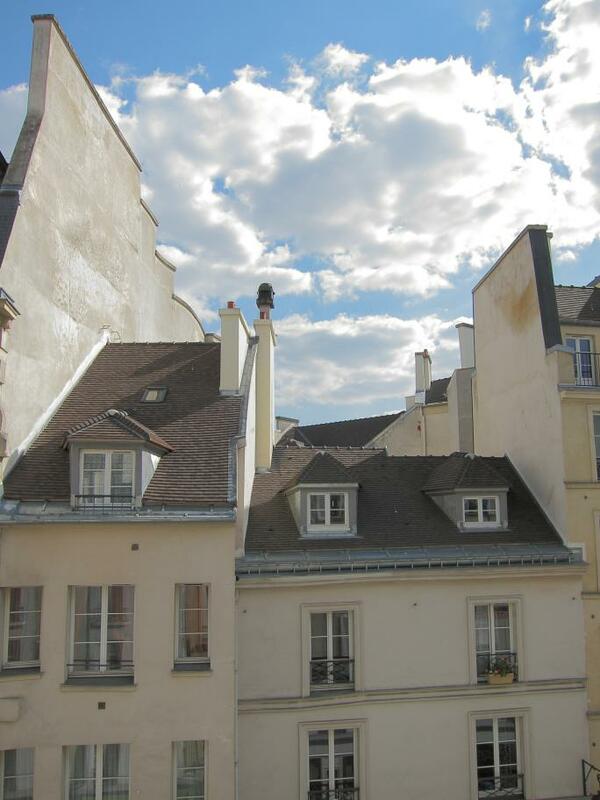 We then strolled down to the Seine and over into the Latin Quarter. As we arrived at the Jardin du Luxembourg Matt suggested a picnic. 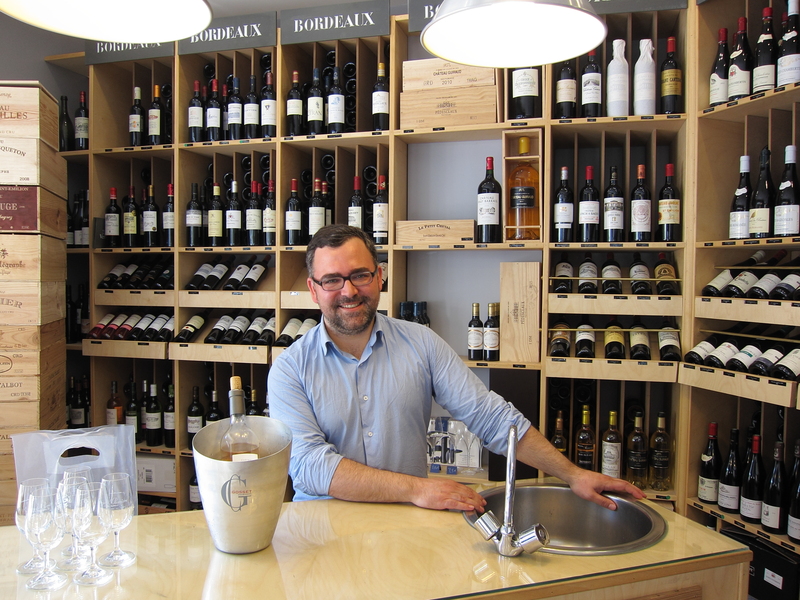 I ducked into a crisp-looking wine store and asked the friendly proprietor whether it is permitted to have a picnic with wine in the park. 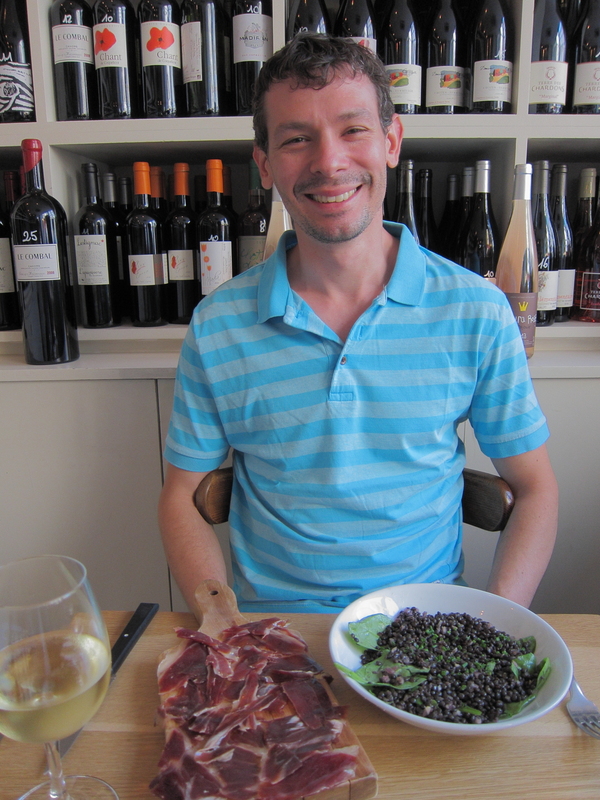 He said yes, then directed us to a nearby cheese store and boulangerie and suggested two refreshing rosés. When we asked for plastic cups he offered to loan us real wine glasses! Our compliments to the Cave du Senat. 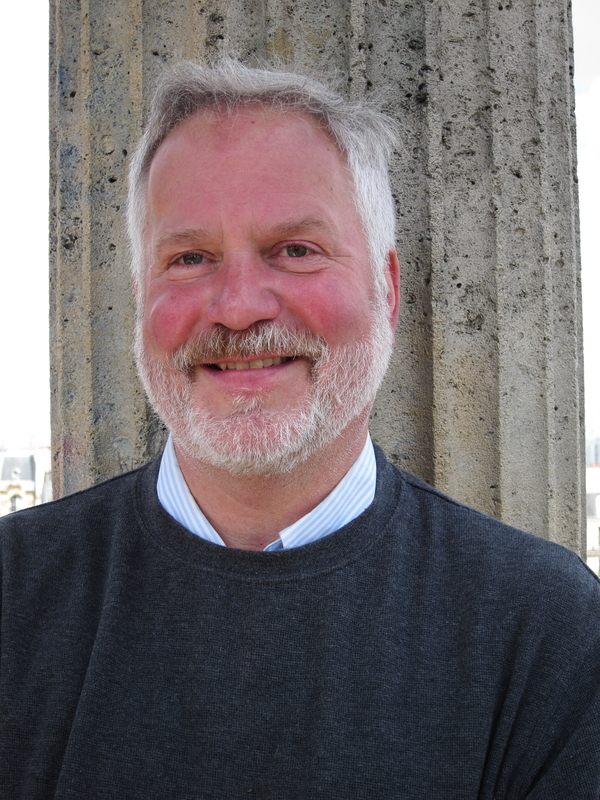 The proprietor of the Cave du Senat. Our picnic was lovely, although there was a glitch. We had invited Antoine to join us but just before he arrived he suffered a wardrobe malfunction and had to hightail it home, then off to his tutoring gig. As we finished exploring the park Antoine suggested that we meet him before dinner at Rosa Bonheur in le parc des Buttes-Chaumont. 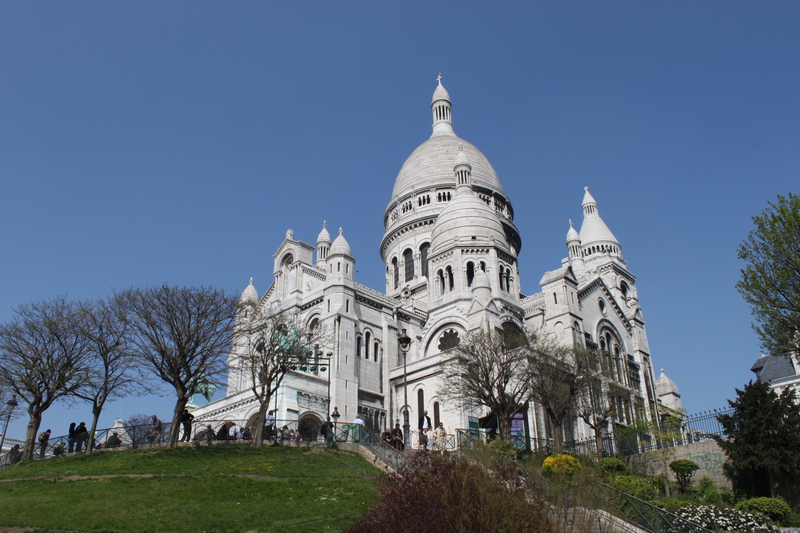 I had been planning to take Matt and Chris there on Sunday afternoon, which is the gayest time, but the weather seemed perfect so we set out by bus — despite my ignorance of the need to flag it down — and métro. We got there in time to see the last few sunbathers, and to get a photo in the late afternoon light. 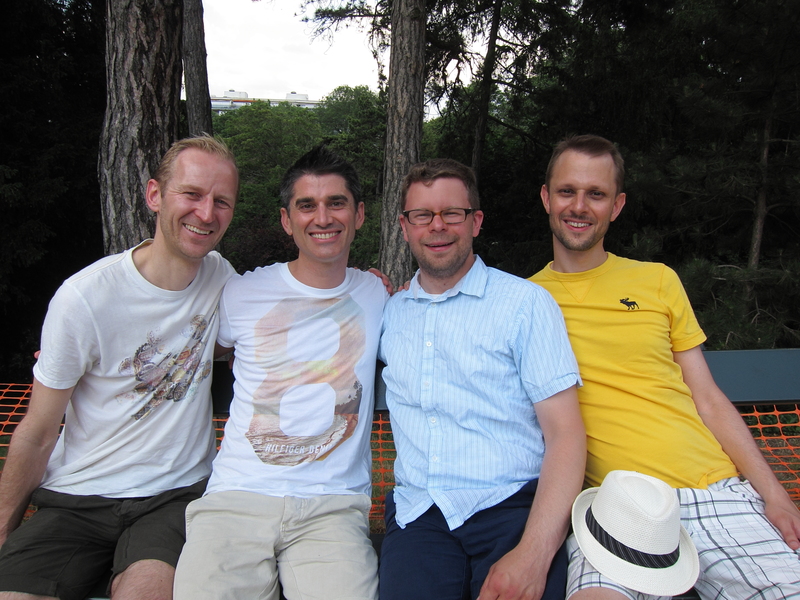 Morton, Jamie, Chris and Matt at le parc des Buttes-Chaumont. 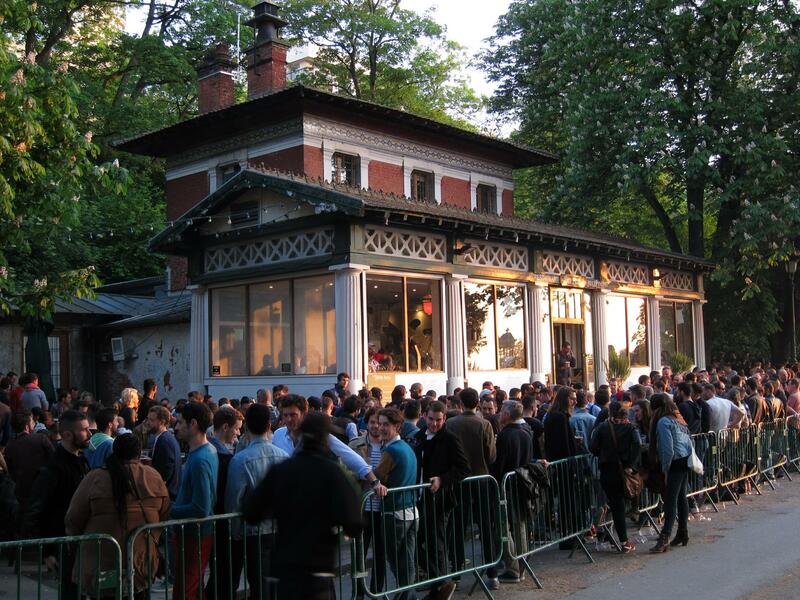 By the time we circled back to Rosa Bonheur the crowd was growing — perhaps 1/3 gay even on a Friday — and we arrived just as the crowd-control barriers went up. We bought our third bottle of rosé to toast the moment, then … umm … perhaps one or two more, while we waited for Antoine (who arrived a few minutes later) to get to the front of the very slow entrance line. 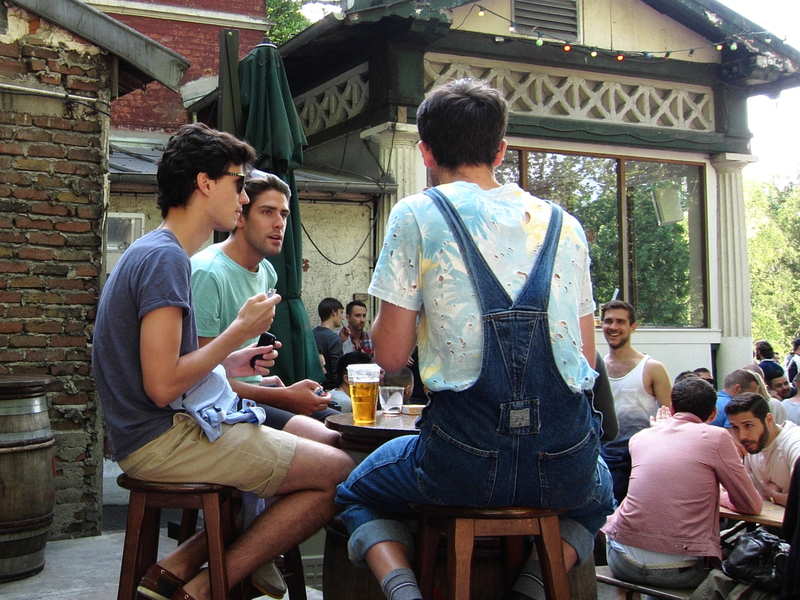 We had saved a few glasses of wine to help him catch up, but just as he was finishing it started to rain, and everyone headed for the interior of the little guinguette. Rosa Bonheur after everyone took refuge indoors from the rain. While the rain was annoying I was glad that Matt and Chris got to see the indoor scene, which can be quite fun. Fortunately the rain stopped fairly quickly, and we were treated to a lovely sunset. 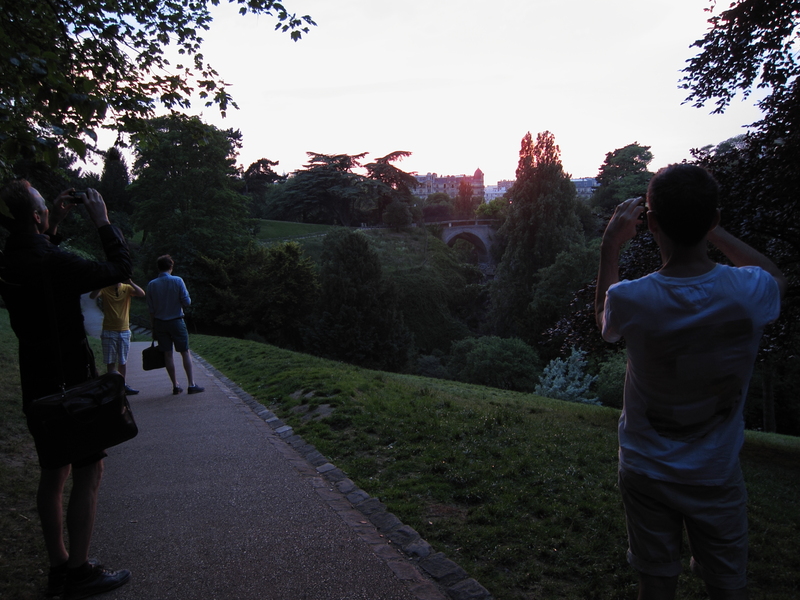 Sunset at le parc des Buttes-Chaumont. 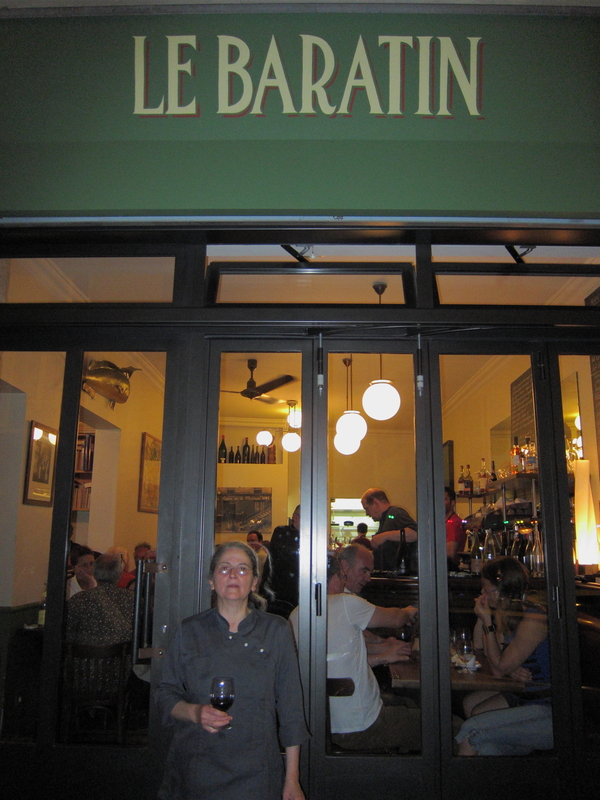 Antoine had made reservations at Le Baratin, a restaurant in the 20ème that is frequented by the chefs of other top restaurants. 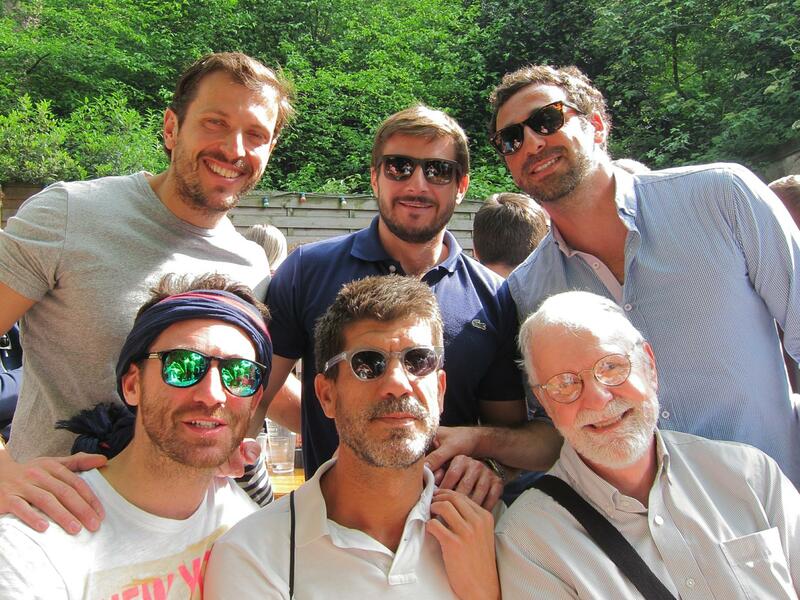 Morton, Jamie, Bob, Matt, Antoine and Chris at Le Baratin. 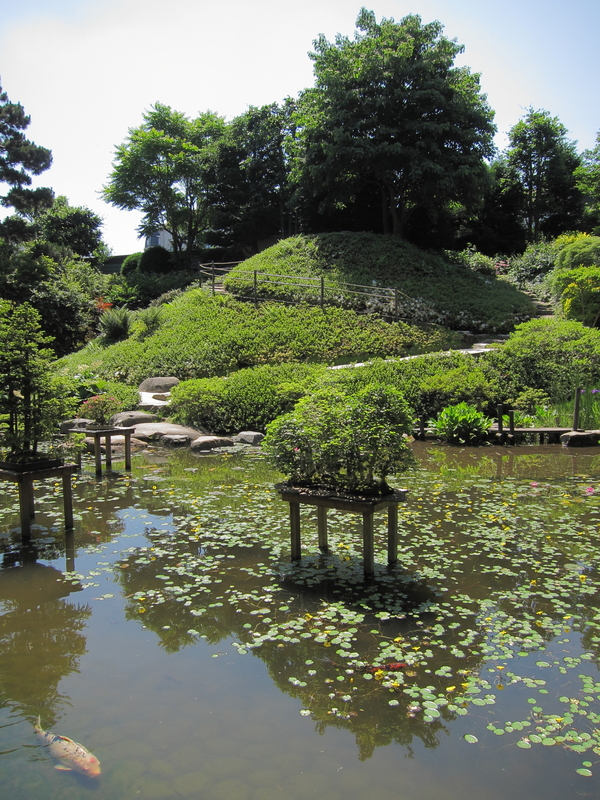 It’s quite an appealing place, but it caters more to French patrons than to tourists. Our experienced and persuasive waiter commented, for example, that I was “as bad as the Chinese” when I took a snapshot of my meal. 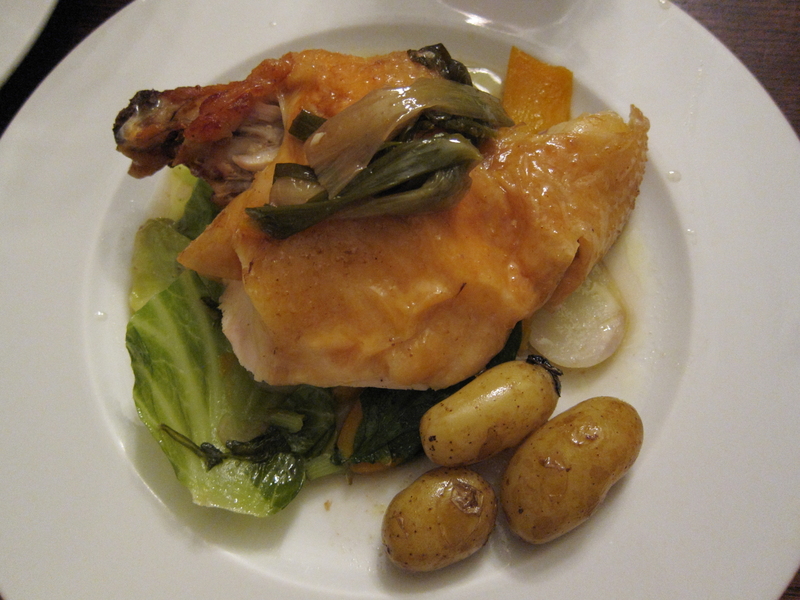 My tender poularde at Le Baratin. NOT to be called « poulet ». As we left I noticed a mature woman having a smoke outside the front door. After she confirmed that she was the chef, she agreed to let me take her photo. The chef outside Le Baratin. On Saturday Matt, Chris, Jamie and Morton went off to Versailles, which I have visited several times. I did laundry, ironing, grocery shopping, and, just for you, gentle reader, wrote a week’s worth of blog posts. Sunday morning we all caught up again for breakfast, in the Haut Marais, then wandered down to the Place des Vosges, and finally back to the 2ème, where Matt, Chris and I said our farewells to Jamie and Morton, then set off to le Musée des Tramways à Vapeur et des chemins de fer Secondaires français (the Museum of Steam Tramways and Secondary Railroads of France), about an hour from Paris by train. 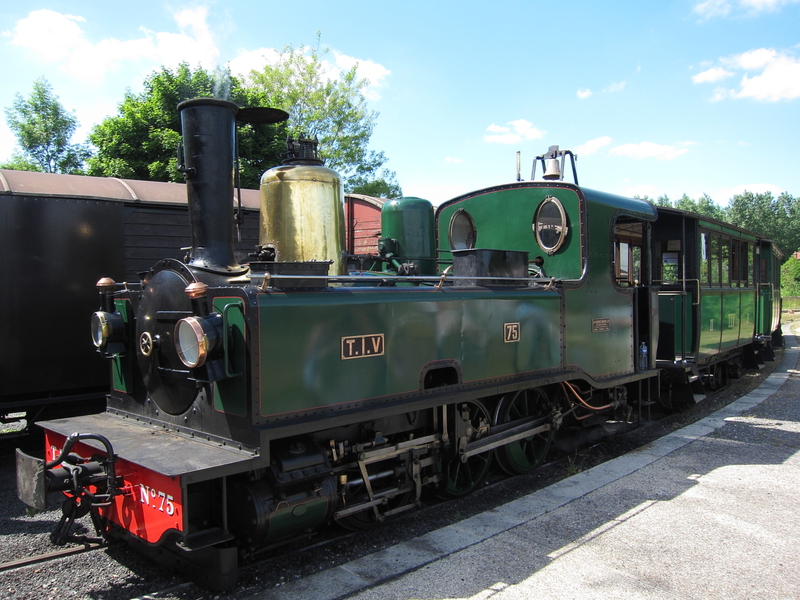 This proved to be a charming little museum, with the additional benefit — only two days a month — of a ride on a steam-powered secondary train! 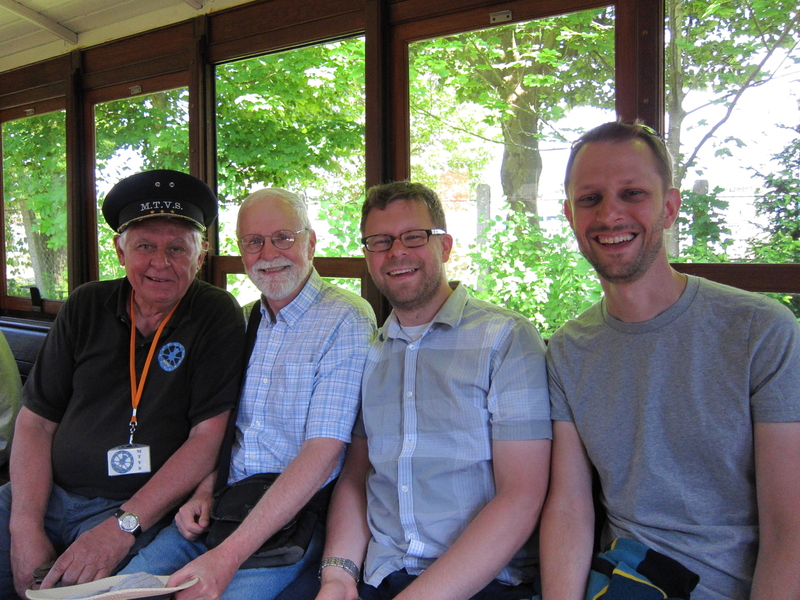 We got to ride on this working steam tram from the turn of the last century. Not only were there no other foreign tourists there, but the friendly volunteer staffers told us that they get almost no foreigners ever. 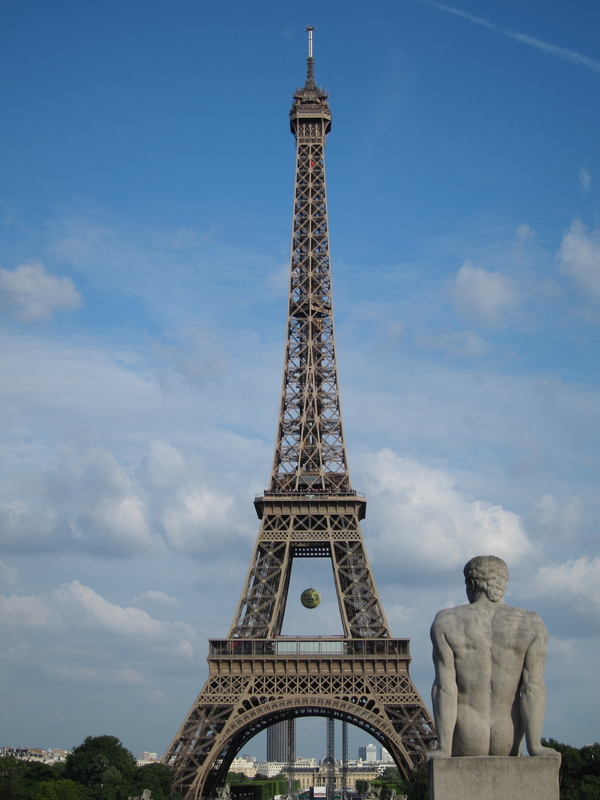 I trust that our train-loving friends will fix this on their future visits to Paris! Bob, Chris and Matt with Bob’s new French bff. We had neglected to eat lunch, and nothing was open in the vicinity of the museum, so we were starving by the time we got home. 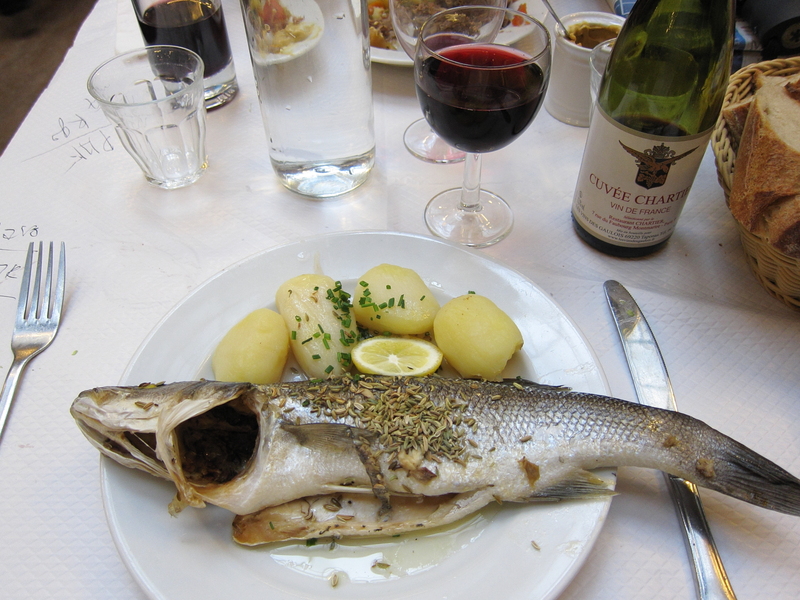 A restaurant on rue Montorgueil that I have turned my nose up at many times because of its English name — Little Italy — satisfied our hunger rather well. Travel Note: I realized half-way through the trip that I had made a 6 euro travel error. 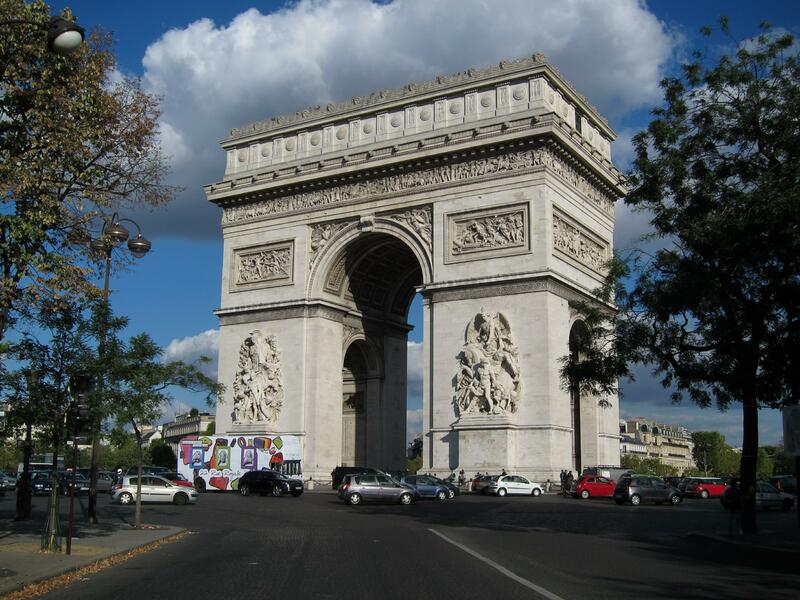 I had purchased one-way tickets to Valmondois for all of us, forgetting that my monthly Navigo pass includes the entire Ile-de-France system on weekends and holidays. We only bought two tickets back to Paris after I confirmed this with the clerk at the train station. The monthly Navigo pass for zones 1 and 2 now costs 70 euros. It’s fun to just slap your wallet on the métro gate like the cool kids but it doesn’t really save money unless you use the weekend deal a few times a month. Note also that the weekly Navigo does not include the Ile-de-France deal. After several busy days we were happy to make it an early evening. The first two days of summer have been gorgeous! 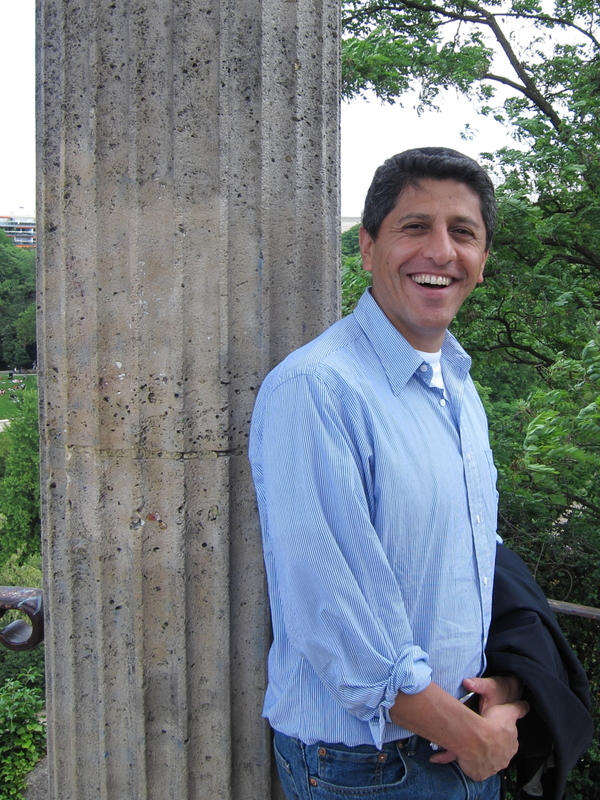 On Sunday, after blogging, I headed over to my old favorite, the Parc des Buttes-Chaumont. I got a picnic lunch at the boulangerie on the corner. Naturally I ordered in French but I was bemused to see that the sign describing their sandwiches was in English. I asked the clerk about it and she said that they get a lot of tourists. 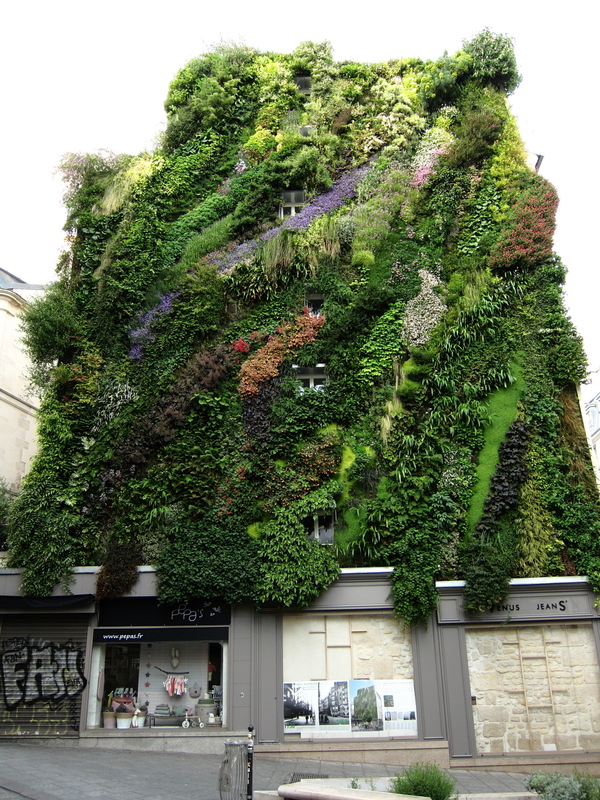 At one of least-central parks in Paris? Hélas! I got a little sun myself but I’m afraid that I mostly soaked up ambiance. Sunbathers on the field below Rosa Bonheur in the Parc des Buttes-Chaumont on a sunny Sunday. 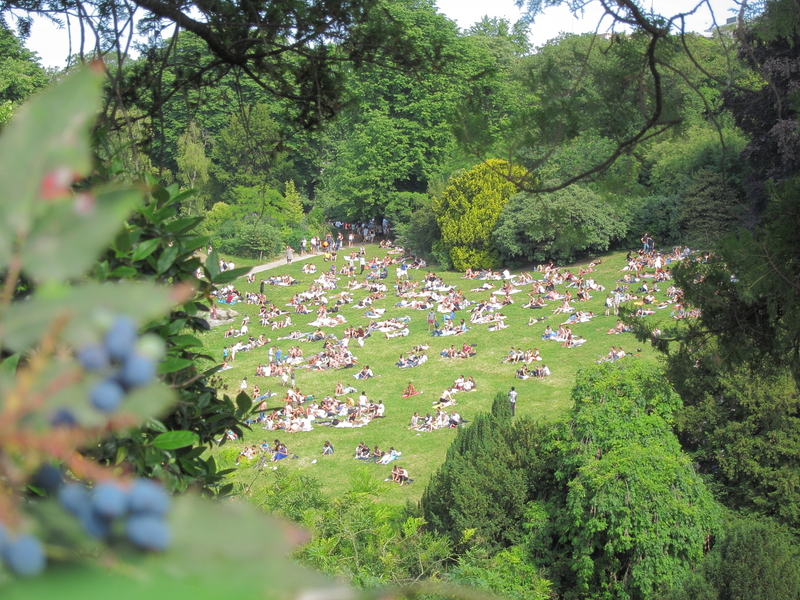 Sunbathers on the field below Rosa Bonheur in the Parc des Buttes-Chaumont on a sunny summer Sunday. When I was sated with the field I had a drink at Rosa Bonheur,. 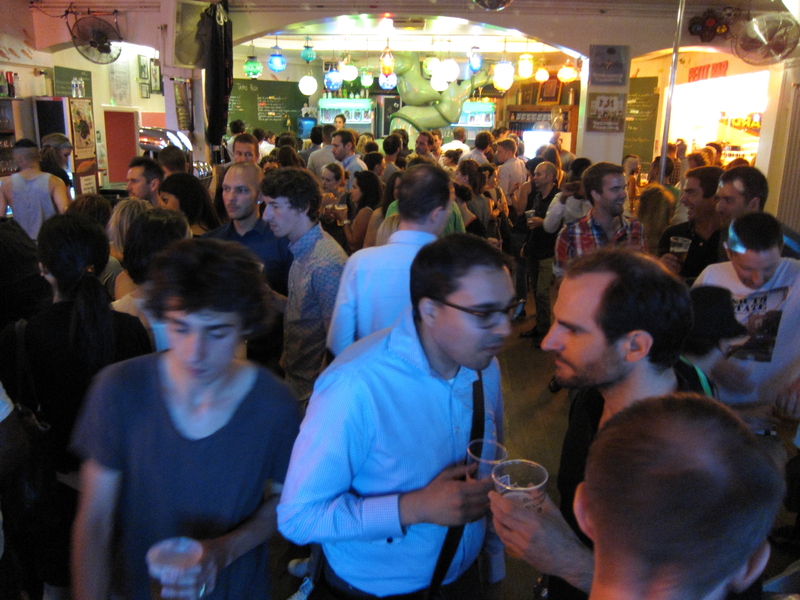 It was a lively scene, as usual, but I didn’t know anyone, and unfortunately I left before Sylvain arrived. 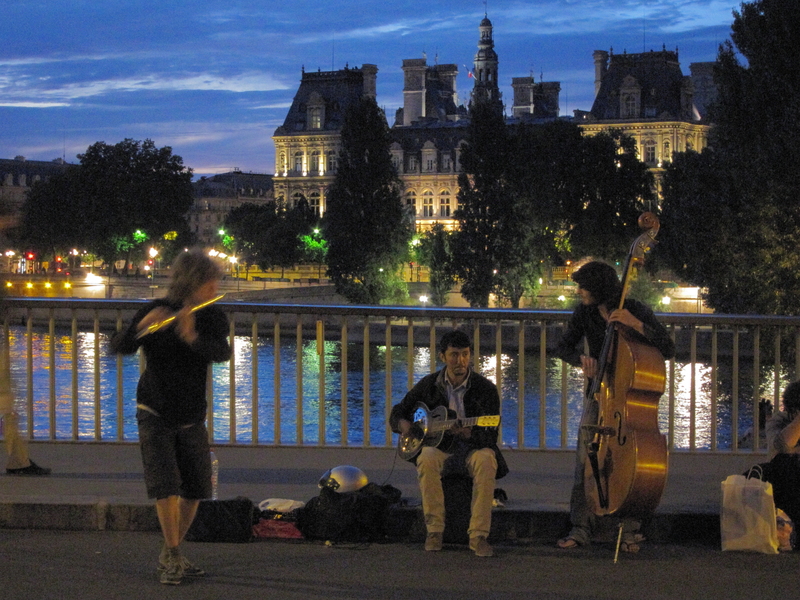 Sunday evening I took a walk down to the Seine and came across a mellow trio on the Pont Saint-Louis, which was just what the doctor ordered. Street musicians on Pont Saint-Louis, between L’île Saint-Louis and L’île de la Cité. This morning I set off once again for Senlis, and once again was discouraged at the railroad station by the continued disruption of schedules due to various transport strikes. I finally decided to instead do the next walk from ParisInconnu.com. 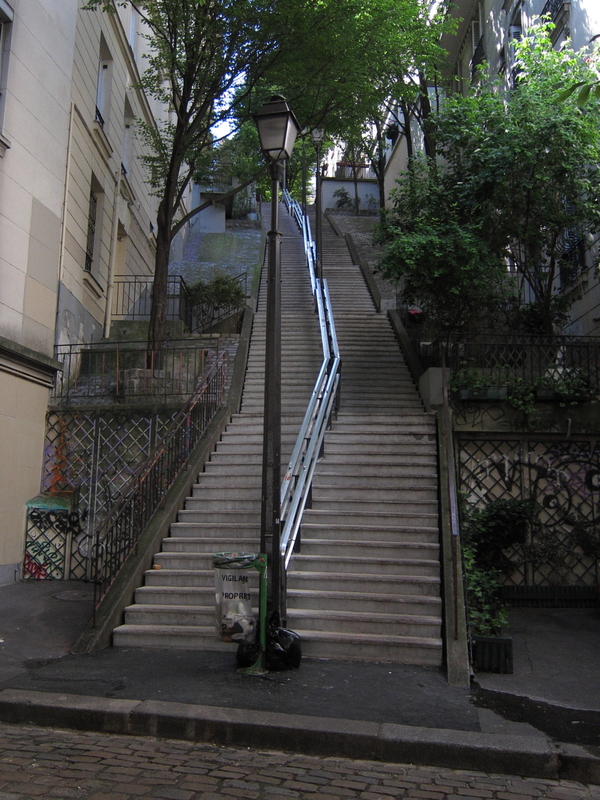 This started at Batignolles, where I had left off the last walk, so I took the métro to Brochante. This gave me another opportunity to explore that neighborhood. While I still think it will get a big boost from better métro service I also noticed a lot of run-down real estate, and run-down folks. So I’m not in a particular hurry to live there after all. 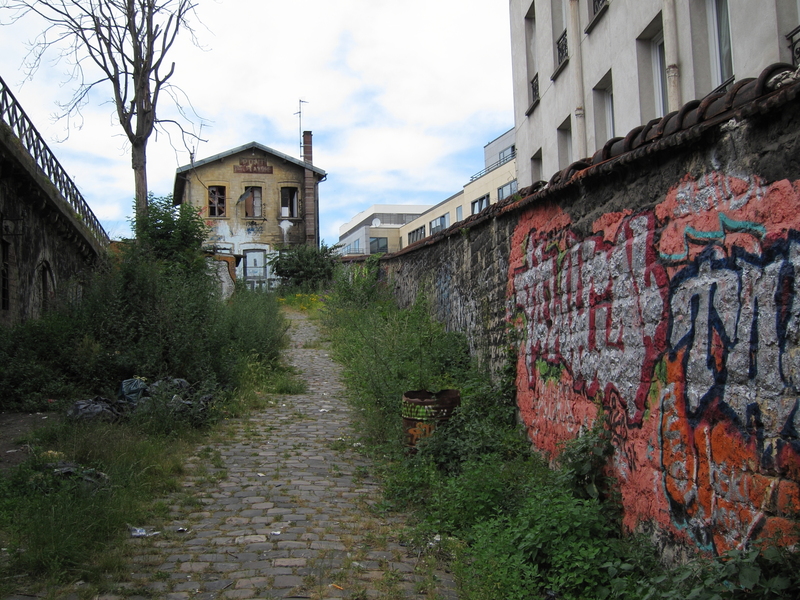 Today’s walk followed the northern arc of the Petite Ceinture (little belt), a circular railway line around central Paris that was built in 1852 but was abandoned in 1932. Two sections of it have been turned into linear parks, but most of it is just an abandoned strip of extremely valuable land. 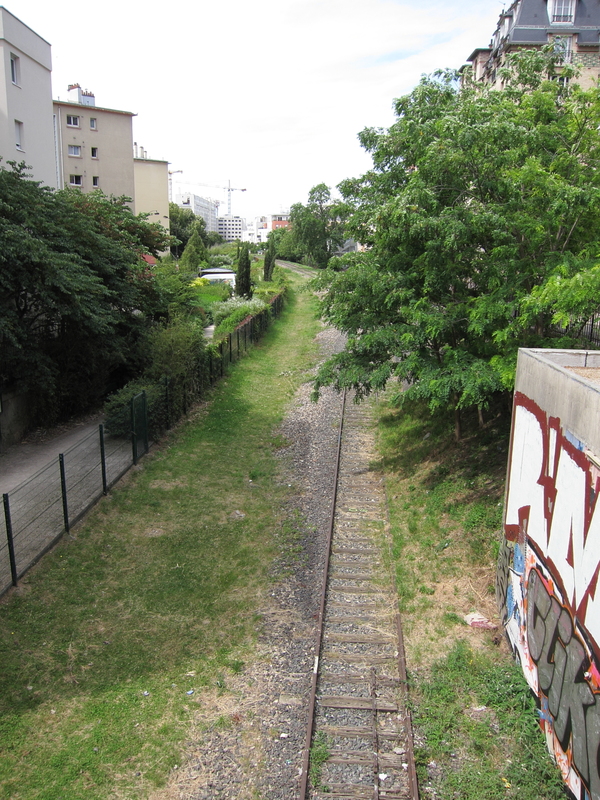 The Petite Ceinture, an abandoned railroad line that circles Paris. 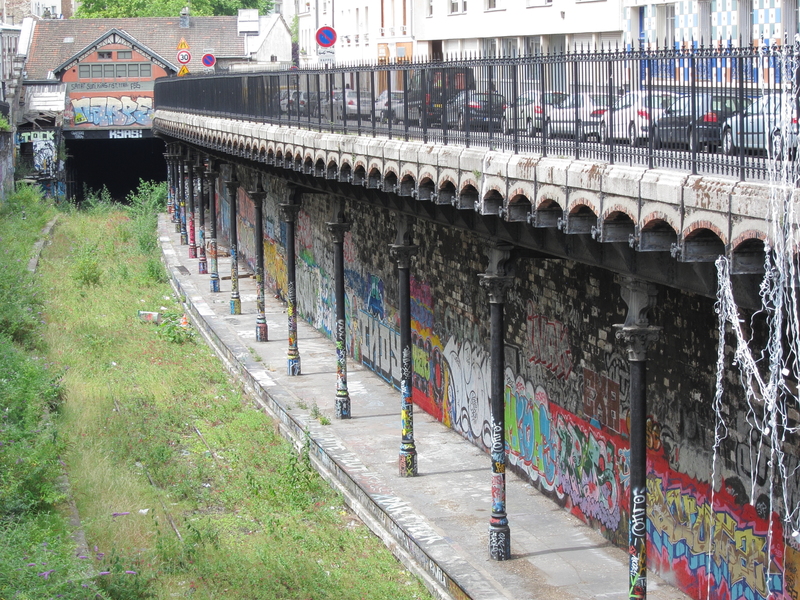 It will be very interesting to see what Paris decides to do with the Petite Ceinture in the next few decades. I predict that much of it will be developed but that the neighborhoods will have a significant influence on what happens to their segment of the old line. 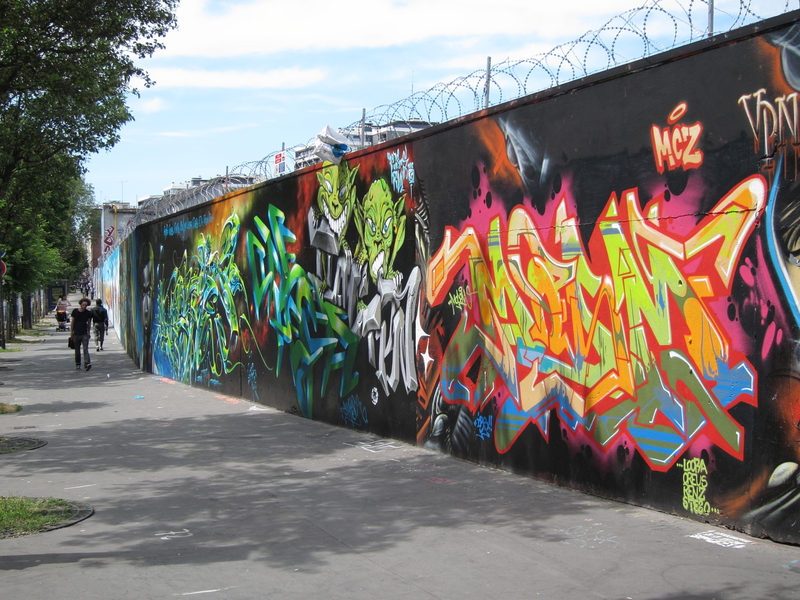 In the meantime, the Petite Ceinture is a wonderful place for street art. Here’s a photo of one abandoned station, and I’ve posted a video clip of the same spot. Street art at an abandoned railway station (gare de l’Avenue de Saint-Ouen) on the Petite Ceinture in Paris. Another abandoned station also appealed to me. 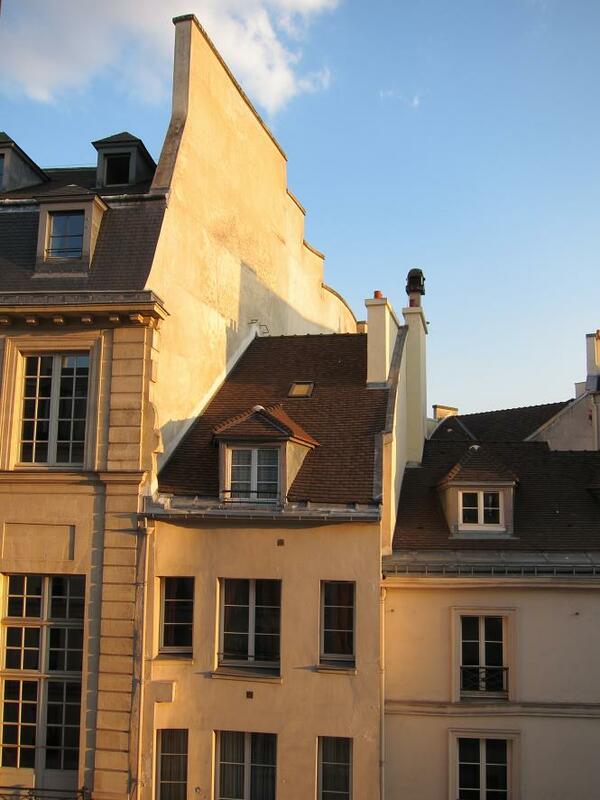 It would make someone a great pied-à-terre, though it’s something of a fixer-upper. The abandoned Pont-de-Flandre railway station on the Petite Ceinture in Paris. 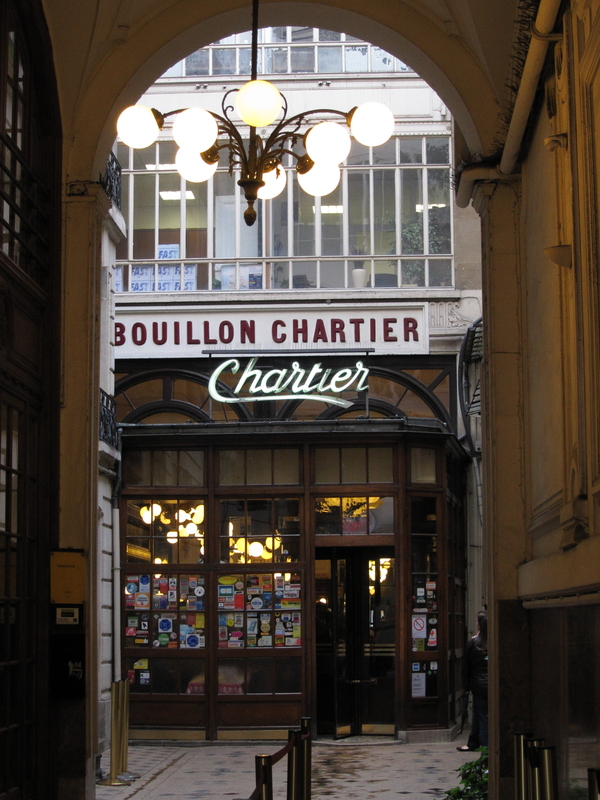 The walk also took me along rue Ordener, where I had been for dinner with Darko last year. In daylight I got a better appreciation of the marvelous street art on the wall alongside the adjacent railroad yard. Street art on a wall along rue Ordener in Paris. 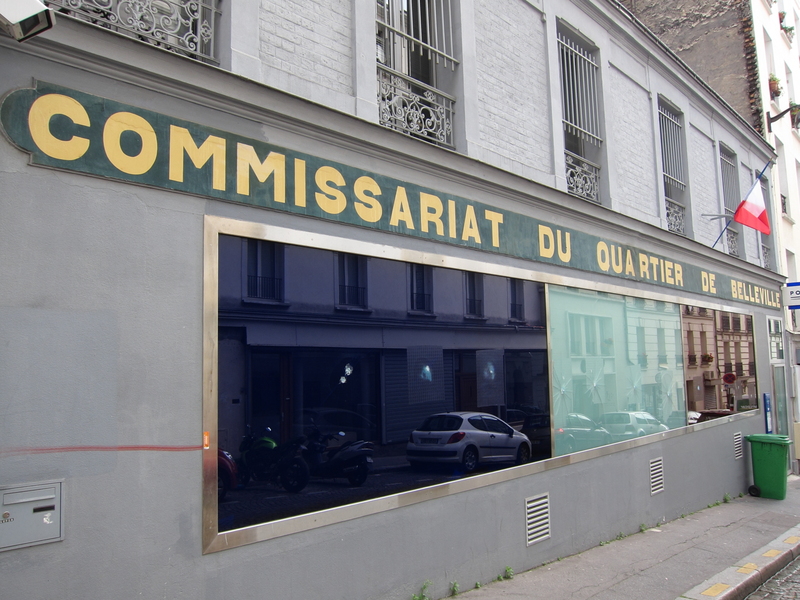 I made a video clip of rue Ordener street art by walking along the wall, although I should caution you that it’s still pretty busy even after YouTube did its best to stabilize it. Both videos are HD so make sure to select that option. I’ve been pretty happy overall with the ParisInconnu.com walks, but this particular one (Parcours 9 – Evangile) became very inaccurate towards the end. Obviously the person who wrote it up made sketchy notes, then didn’t cross-check with an accurate map before publishing it. I’ve been messaging them on Facebook with my corrections but I haven’t yet gotten a reply. I do wonder, however, whether nobody else has tried to follow the walks, or whether others have encountered the same issues but not reported them, or whether others have reported the same issues and the organizers are incompetent. All options are a bit sad in one way or another. Less than a week to go in my petit séjour. It’s normal, towards the end of a long trip, that one’s thoughts begin to bend towards home. But there’s also always sadness in the endings of good things. Mot du jour: Vous parlez très bien le français. A comforting thing one says to a foreigner who is struggling to find the right word or phrase; the equivalent of saying “there there” to a crying baby. It’s a gorgeous day and I must get out and enjoy it! But I’ve fallen woefully behind with my blogging, so here goes. 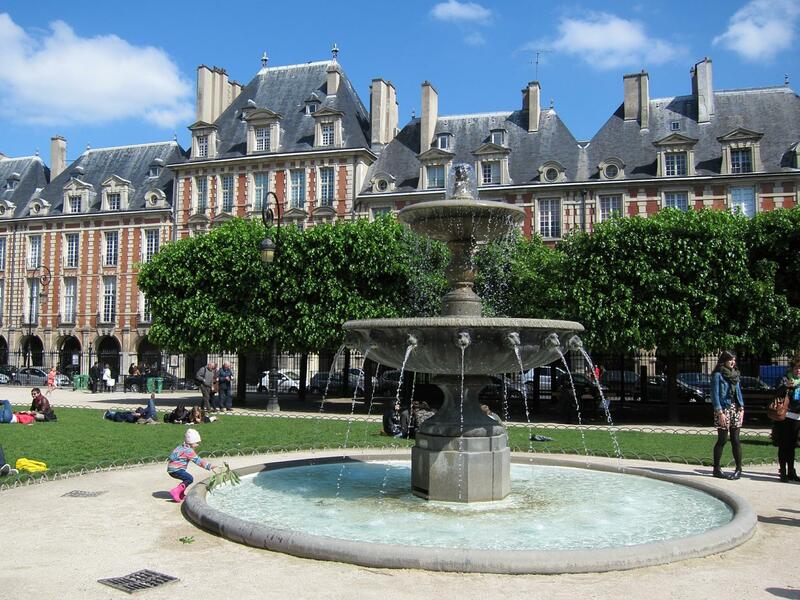 On Saturday I did some errands, then headed over to Place des Vosges, which is just a few blocks away. It was chilly, but lovely nevertheless. Place des Vosges on a Sunny Saturday. 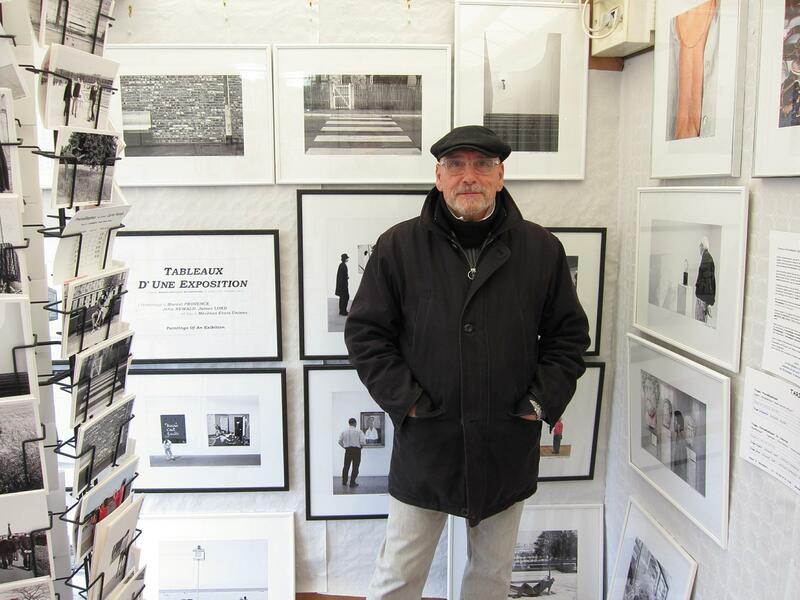 My ultimate destination was the Grand Marché d’Art Contemporain 2014 à la Bastille. It was much larger than I expected, with more than 500 artists! Most were terrible (imho), but as usual I found a few that I really liked. It was a pleasure to carry on conversations with them, almost always in French! And in most cases the artist agreed to pose with some of his or her works. The full photo set is at Art and Artists, and here are a few of my favorites. That evening I indulged in a walk down memory lane, visiting the neighborhood of each of my prior apartments. I had a beer at L’Open Café for old time’s sake. It solitary except for a handsome bar back who let me take his photo (despite falsely claiming to be ugly). A barback at L’Open Café distributing candles. 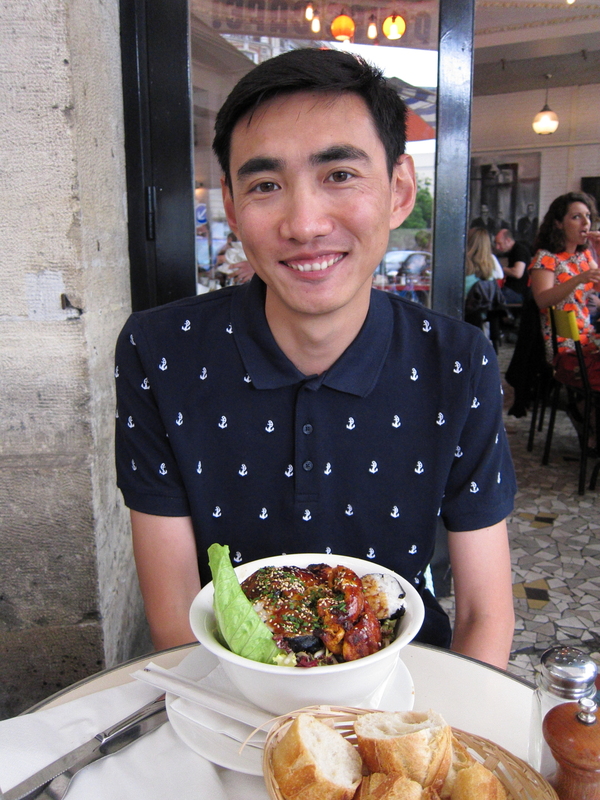 Abandoning myself to nostalgia, I had dinner at Le Loup Blanc (which closed in 2014), where I ate on the first evening of my first petit séjour, in 2010. 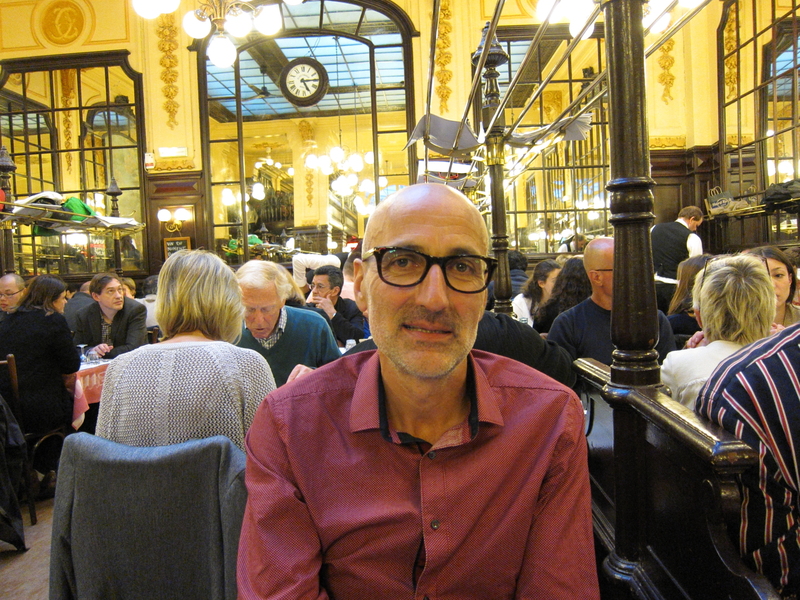 The gay waiter I like was still there — as handsome, slim and diffident as ever. The salmon was even better than I remembered! 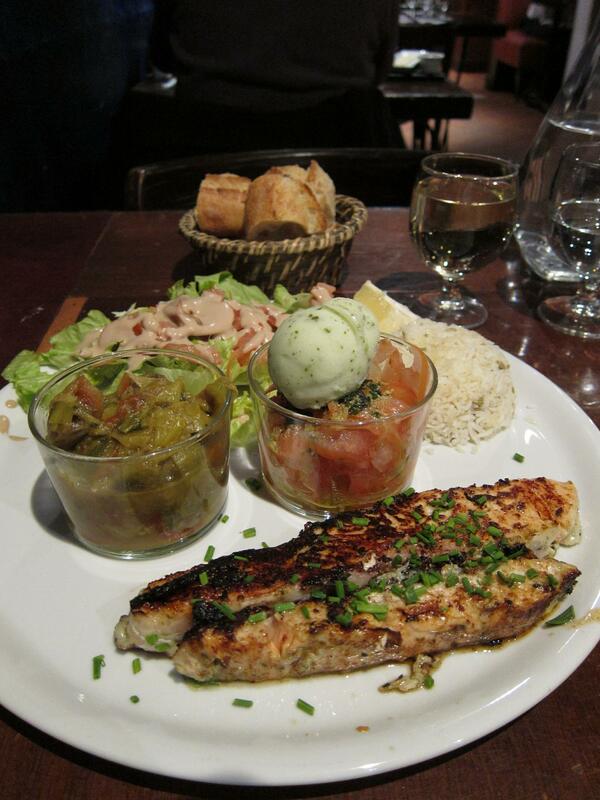 Salmon dinner at Le Loup Blanc. 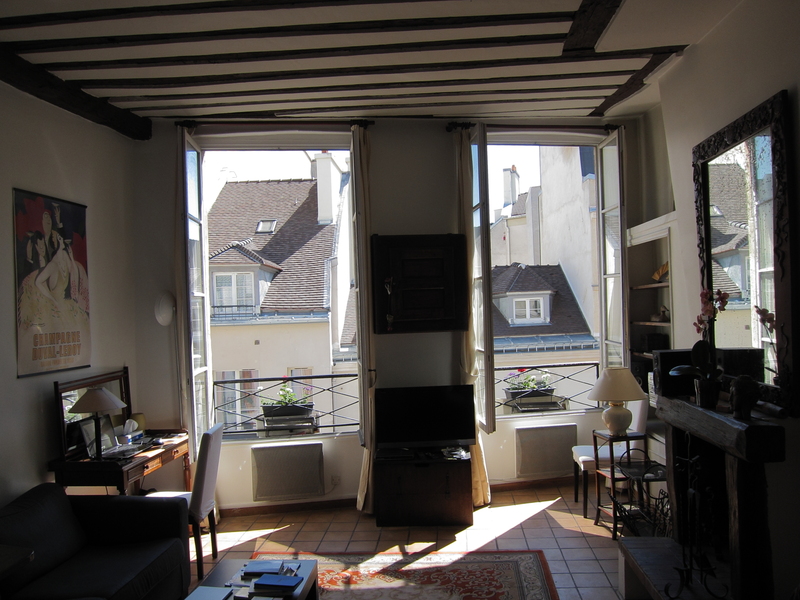 Then I hopped on a Vélib’ and rode over to Le Duplex, one of my favorites among Paris’s many gay bars. It was busy, as expected with a diverse and genial crowd. At first I just looked around, and eavesdropped on the animated conversation of two forty-something neighbors. Eventually someone broke the ice and the three of us had a friendly and interesting conversation. 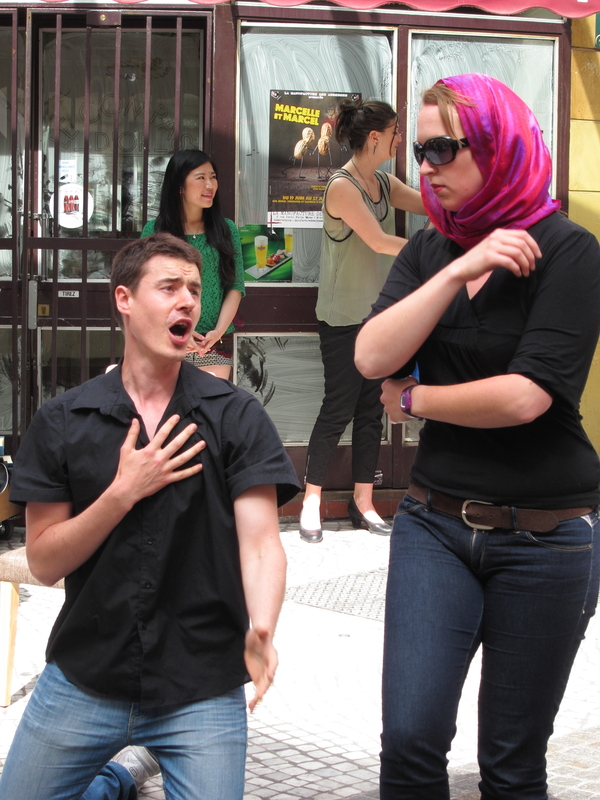 (The weren’t a couple — the suggestion horrified them! — but they had dated for about a week ten years ago.) A bit later on I spotted Lisa’s Geoff across the crowded room; he stopped by to say hello but was busy with a group of friends. I’m sure we’ll catch up again later in my stay. I’ve fallen in love with my new neighborhood, and the virtues of this year’s apartment are growing on me, despite a few maintenance issues that I hope to persuade the owners to take care of. Do you think I should take a series of photos out my windows along the lines of Monet’s haystacks? The view out my living room windows – near sunset. The view out my living room windows – midday. 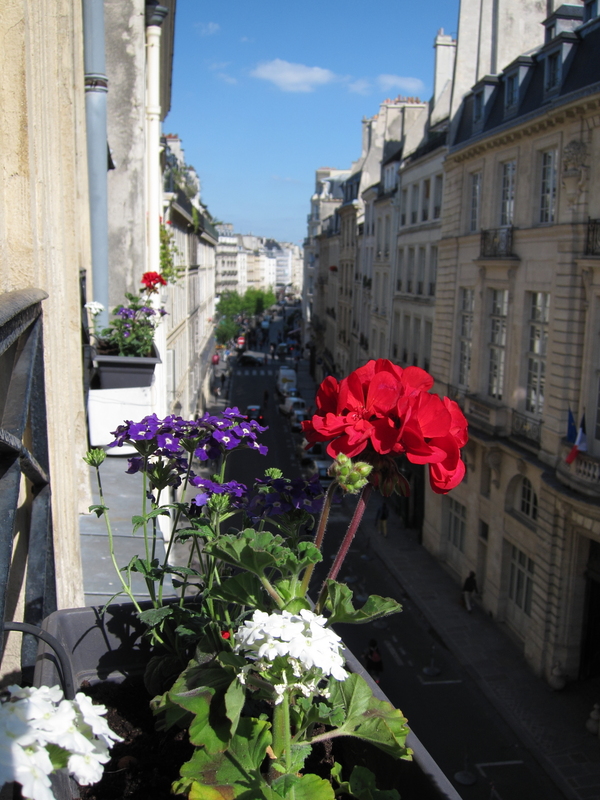 I got a bit of a late start on Sunday, then took a walk — to the Haut Marais, Place de la République, then Canal Saint-Martin. I had a quite good brunch at Chez Prune. I love the location and ambience but I really must remember how unfriendly the service is. Then I climbed up to the Parc des Buttes-Chaumont to make my first pilgrimage of the year to Rosa Bonheur. It was busy at 2:30 but the only line was to order since the barriers weren’t yet up. 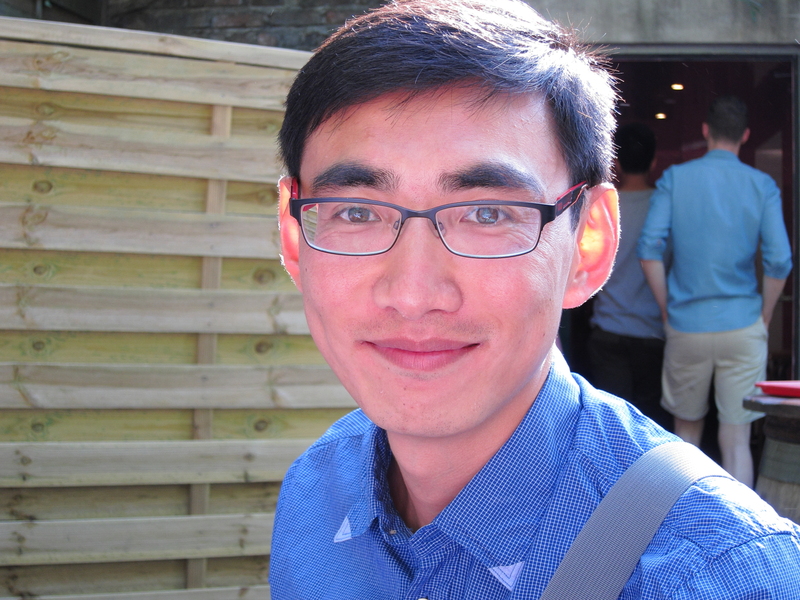 I was alone at first — is a pattern emerging? — then I met a group of super-sweet Spanish guys who were visiting a French friend for a few days. 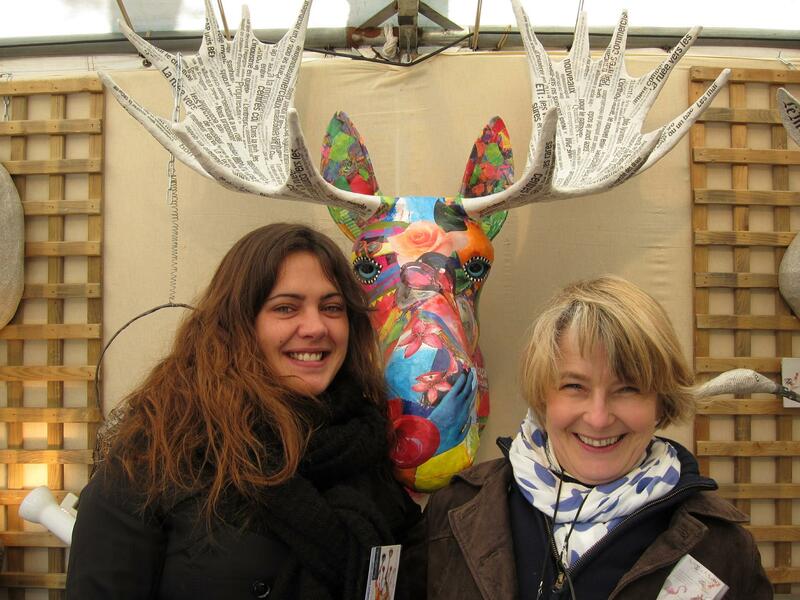 New Friends at Rosa Bonheur. We had a lovely conversation, “code switching” among Spanish, French, Catalan and English. I joined them for dancing afterwards, but eventually I excused myself, sated — for the moment — with the magic of Rosa Bonheur! Rosa Bonheur on a gorgeous Sunday afternoon. I finished the gentle evening with an unassuming but pleasant meal at Bodega 64, just across the street from my apartment. Mot du jour: moche. Ugly, horrible, tacky, trashy, terrible, etc. etc. Typically used, in my experience, by people falsely denigrating their own good looks.